A mysterious arc of light found behind a distant cluster of galaxies has turned out to be the biggest, brightest and hottest star-forming region ever seen in space. The so-called Lynx arc is 1 million times brighter than the well-known Orion Nebula, a nearby prototypical star-birth region visible with small telescopes. The newly identified supercluster contains a million blue-white stars that are twice as hot as similar stars in our Milky Way galaxy. It is a rarely seen example of the early days of the universe where furious firestorms of star birth blazed across the skies. 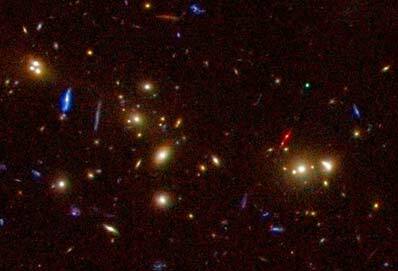 The spectacular cluster's opulence is dimmed when seen from Earth only because it is 12 billion light-years away. The discovery of this unique and puzzling object was the result of a systematic study of distant clusters of galaxies carried out with major X-ray, optical, and infrared telescopes, including NASA's Hubble Space Telescope, ROSAT, and the Keck Telescopes. Robert A.E. Fosbury of the European Space Agency's Space Telescope-European Coordinating Facility in Germany and an international team of co-authors report the discovery in the Oct. 20 issue of the Astrophysical Journal. The megacluster of stars appears as a mysterious red arc behind a distant galaxy cluster 5.4 billion light-years away in the northern constellation Lynx. The arc is the stretched and magnified image of a mysterious celestial object about 12 billion light-years away (at a redshift of 3.36), far beyond the cluster of galaxies. This means that the remote source existed when the universe was less than 2 billion years old. Fosbury and his colleagues first tried to identify the arc by analyzing its light, but the team was not able to recognize the pattern of colors in the spectral signature of the remote object. While looking for matches with the color spectrum, Fosbury realized the light was related to that of the nearby Orion Nebula, a star-forming region in our own Milky Way. However, where the Orion Nebula is powered by only four hot and bright blue stars, the Lynx arc must contain around a million such stars. Furthermore, the spectrum shows that the stars in the Lynx arc are more than twice as hot as the Orion Nebula's central stars, with surface temperatures up to 144,000 degrees Fahrenheit (80,000 degrees Celsius). Though there are much bigger and brighter star-forming regions than the Orion Nebula in our local universe, none are as bright as the Lynx arc, nor do they contain such large numbers of hot stars. Even the most massive, normal nearby stars are no hotter than around 72,000 degrees Fahrenheit (40,000 degrees Celsius). However, stars forming from the original pristine gas in the early universe can be more massive and consequently much hotter -- perhaps up to 215,000 degrees Fahrenheit (120,000 degrees Celsius). The earliest stars may have been as much as several hundred solar masses, but the chemical makeup of the universe today prevents stars from forming beyond about 100 solar masses. 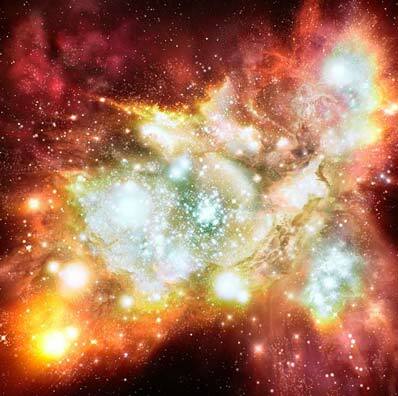 Such "primordial" super-hot stars are thought to be the first luminous objects to condense after the big bang cooled. Astronomers believe that these first stars formed considerably earlier than the Lynx arc -- up to 1.8 billion years earlier. "This remarkable object is the closest we have come so far to seeing what such primordial objects might look like when our telescopes become powerful enough to see them," says Fosbury. The desire to find and study the first luminous objects in the universe is the main scientific drive behind the construction of NASA's James Webb Space Telescope, scheduled for launch in 2011. The team is composed of R.A.E. Fosbury (European Space Agency/Space Telescope-European Coordinating Facility, Germany), M. Villar-Martin and A. Humphrey (University of Hertfordshire, UK), M. Lombardi and P. Rosati European Southern Observatory, Germany), D. Stern (Institute of Geophysics and Planetary Physics), R.N. Hook (ST-ECF/STScI), B.P. Holden and S.A. Stanford (University of California), G.K. Squires (SIRTF Science Center), M. Rauch (The Observatories of the Carnegie Institution of Washington), and W.L.W. Sargent (California Institute of Technology).